In 1981, The Christian Broadcasting Network created a children's animated Bible series as part of an outreach to the nation of Japan. Little did we realize what impact the series would have in Japan and throughout the world. The English name for this series was "Superbook." Research performed during and after the outreach showed that this series was an unprecedented success. Superbook, also known as Animated Parent and Child Theater, is an anime television series produced by Tatsunoko Productions in Japan in conjunction with The Christian Broadcasting Network in the United States. 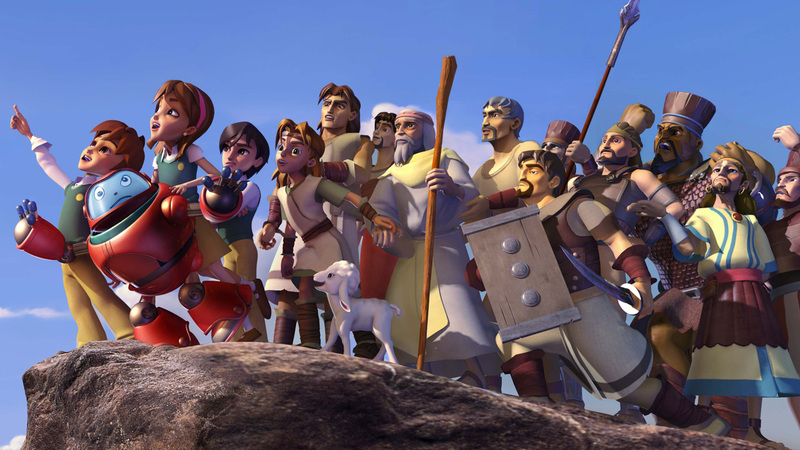 During its launch in Japan, it is estimated that over 4 million people watched each weekly episode of Superbook on television, resulting in the Bible becoming the best-selling book in that country. From Japan, the Superbook series went on to air throughout the world from Asia to North America. By 1989, in the midst of economic and political turmoil, Superbook began broadcasting in the Soviet Union to astounding results. Superbook aired during primetime on the Soviet National Channel. CBN received over 6 million letters from children, introducing a whole new generation to the Bible. Even today, the Superbook Kids Club is one of the highest rated live-action children's programs in Ukraine. Since first airing in Japan, the series has now been broadcast in over 106 countries, translated into 43 languages, and viewed by over 500 million people. Because of today's new storytelling technology, the original series is losing appeal with this media-savvy generation. To solve this problem, CBN is producing a reimagined, computer generated, animated version of Superbook. Our goal is to produce a new series that will honor the life-changing legacy of the original series and re-introduce it to a new generation. What do I do if I forgot my password or username? If you forgot your password, click on the “Sign In” link at the top of the page. In the box that opens up, click on “I forgot my password” below the “Password” field of the form. Once you click on “I forgot my password” a new “Password Recover” form will appear and you will need to enter your username and first name and then hit “Continue”. You will then need to check your email and you will receive an email with a new password that you can use on the website with your username. If at that point, you would like to change your password to something that is more easy for you to remember, then you will need to click on the link in the email that you received and you will be able to change the password to a new one that you will be able to use on our website. If you have forgotten your username contact a Superbook Team Member with the email address you used to create the account. Once you register you will be allowed to create an character, record your scores, save your favorite games, collect SuperPoints, exchange your SuperPoints for cool prizes and use your SuperPoints to get upgrades for your personal profile character! How do I register on Superbook.TV? Click "Registration" in Welcome area of the website. A registration window will open up and you will need to fill out the form. If you are 12 or younger, you will be asked to provide the email of a parent. If you are 13 or older, you will need to provide your own email address, you will receive an email from CBN where you will need to click on a link to activate your account. If you are a CBN community member trying to register a child that is over 13, you will need to use another email address for that child, i.e., create another CBN community account - this will be a new account. How do I change my password and other personal information? To change your password or personal information you will first need to sign you’re your account. Then click on your profile name at the top of the page. Once you land on your profile page, click on "Edit Profile" to the right of your character profile. You will then be able to change your password and any other personal information. How do I make changes to my Superbook personal profile character? Click on the headshot of your character above the top navigation of the website. A drop box will open up and you will need to click on the image of your character, which will take you to your profile page. Beside your character, you will see the words “SHOP” and “CLOSET”. Your character comes equipped with some clothes in their closet. To access these clothes, click on the word “CLOSET” and the clothes in your closet will appear. You can then scroll through the items in your closet using the arrows on each side of it or you can bring up a specific clothing type by making choices below the main images in your closet. The categories of items include: a) ALL b) HEAD GEAR c) TOPS d) BOTTOMS e) SHOES and f) BACKGROUNDS. If you click on any of these items, only items of that choice type will appear. It is here where you will also be able to change your character’s skin tone and eye color as well. If you would like to add more items to your closet, you will want to click on the “SHOP” button. This will bring in new items that you can ‘try on’ and ‘buy’ for free or through the exchange of SuperPoints. Once you ‘buy’ an item by either clicking on the ‘buy’ button or the “BUY WHATS ON” button, which will appear above the “SHOP” and “CLOSET” buttons when you are trying on something, that item will stay on your avatar and also go into your closet. How do I register multiple children? The way we have set up the registration system is to enable multiple children to be connected to the same parent's email address. So, when you register each of your children, each can have their own username and password and they will also be able to have their own SuperPoints and create their own online character, as well. The main thing will be to logout of the account that you have already created, and then go through the same process of registration that you did with the original account, entering the new username and password for each child, using the same email address. SuperPoints are accumulated through game play on Superbook.TV by registered users. Right now, you can visit our contest page and exchange SuperPoints for entry into our contests. Or you can use them to upgrade your personal profile character with some cool clothing items. What are badges and how do I get them? Once you register to Superbook.TV you will have the opportunity to win badges for SuperPoints that you’ve earned, creating your Superbook character, registering and much, much more. The more you play, the more badges you win! How do I add my favorite game to my profile? To add a favorite game log on to the website (after you have registered) and click on the “GAMES” button on the top navigation bar. Click on the game you wish to add. Once the game page has opened up, you will see a ‘thumbs up’ image. After you click on this image the game will be added to your profile page under your “FAVS” as well as within the drop down box that opens up when you click on your character profile headshot above the top navigation of all website pages. Can I play the games if I don’t register? Yes, you can play all the games on Superbook.TV even if you don’t register. Will you be adding new games? Yes, we are always working to update Superbook.TV with fun new games and features. Check out our newest games on our games page. How do I turn the sound off on the games? Do I need special software to play the games? You may need the latest version of flash software. Also, these Flash games will not work on iPad, iPod Touches or iPhones. Download Flash here for free! Do I need special software to view the Gizmo’s Bible Adventures Devotional? You may need the Adobe PDF Reader to view the online devotional. Download it here for free! Do you have any other online devotional materials for children? You can subscribe to receive a daily email that will take you to our Daily Bible Challenge. Each day The Daily Bible Challenge offers children a Bible verse to read and then games that will help them to become more familiar with the Bible verse and to get a little deeper understanding of how that verse can apply to their lives. The games include Word Searches, Multiple Choice Quizzes and a Verse Retype. Why did you create this web site? We are working hard to create an entertaining place where your child will want to come, play, and interact with our activities. Whether it is our kids games, our online Bible, Superbook Radio, our personal character creator, or our interactive questions about God, we want kids to have fun on our site while simultaneously learning about the Bible and growing in their relationship with Jesus. Is this website safe for children? We’ve designed our website to be a safe place for kids, but the best safety children can have is their parents’ or guardian’s involvement with their online activities. We encourage you to spend time with your child online, not only to supervise their activities and educate them, but also to encourage them with what they are learning within our site. For more information please visit our Info for Parents page. Will I have control over my child’s Superbook account? Yes. When your child (under age 13) signs up to join the Superbook Kids website, we notify you by e-mail so that you are aware of their desire to take part in our community. Your child’s registration allows them access to all kinds of fun activities within the site, such as taking part in contests or being able to save the points they accumulate while playing our online games. We may also periodically send you an e-mail to let you know of new games that are being added to the site or about future contests that may be of interest to your child. All information that is collected on this site is used to help us improve our site for your child’s enjoyment. For more information please visit our Info for Parents page. Register on the site. This takes place in the upper right hand area of the site. Play games on the site, while you are logged in to the site. The higher your scores, the more SuperPoints you can win. These SuperPoints are saved to your profile, which can be viewed on the profile page - you can access your profile page through the headshot of your personal character at the top of every page on the website. To enter the contests, you need to go the "Contests" page, this link can be found in the navigation choices on the top any page. Once you land on that page, you click on "Enter Now" for any of the contests and this will take you to the entry page for that specific contest. The entry form will tell you how many SuperPoints are needed to enter a contest and it will ask you how many entries you would like to do. So if a contest entry is equal to 250 SuperPoints and let's say you have 800 SuperPoints earned from playing games, you could enter the contest 3 times (750 SuperPoints) and you would have 50 SuperPoints left over. Once you enter the number of entries that you want to do, you then click "ENTER CONTEST" and you will be entered into the contest. We will contact the winner of each contest via email with further instructions on how to collect their prize. For all contestants under the age of 13, the email will be sent to their parent’s email address. The Superbook staff will contact you via email with instructions on how to collect your prize. Generally, they will ask for an address so we can send the prize to you in the mail. How long do contests usually last? Contest durations vary, but you are able to see the end dates, which are posted on each contest. Be sure to check the Contests and Prizes page for contest deadlines. How long do I have to collect my prize? Winners have a full week (seven days) to respond to the email sent from our Superbook staff from the time stamp on the email. If we do not hear from you within that time period, we will have to choose another winner. How often do you hold contests? We have contests every day of the year. The prizes that we give range from SuperPoints, to Superbook DVD’s, gift cards to iPads and much more. When is the contest winner chosen? The contest winner is chosen after the contest is closed. Why are the contests restricted only to the continental US? Contest law & regulations outside of the United States restrict us from creating international contests at this time. What do I do if I don’t want to collect the prize? If you choose not to collect the prize, please respond back to our email indicating that you wish not to receive it. We will then choose another winner. Please refer to our contest rules. In the “Giant Adventure,” we notice a lack of diversity in the children appearing in Superbook. Will that change in future episodes? Yes. We are currently developing a more diverse mix of children and characters for the modern-day scenes of future Superbook episodes. In “He Is Risen,” why are the nail holes in Jesus’ wrists instead of His hands? The Greek word for hand that is used in John 20:25-27 can also mean the forearm and hand together. Many scientists and scholars believe that the small bones in a person’s palms are not strong enough to support the weight of someone being crucified. Nails placed between the wrist bones (the radius and the ulna) would ensure that the person’s body remains securely on the cross. In “Miracles of Jesus,” why does a man in the crowd turn into Satan? In “Miracles of Jesus,” why is the demon-possessed man in the Gadarene tombs so scary looking, and why does his voice sound so strange? The Bible describes the demon-possessed man very graphically in both Mark 5:1-20 and Luke 8:26-39. His voice sounds as if many people are speaking because he had so many evil spirits. Luke 8:31-32 refers to “the demons” (plural) speaking to Jesus. In “Miracles of Jesus,” why does Satan appear in the storm? Was he causing it? The Bible does not say that Satan caused the storm; however, Matthew 8:26 tells us that Jesus “rebuked” the wind and the waves, and they became still. In other places in the Gospel, the word “rebuke” is used when Jesus takes authority over demonic power. (See Matthew 17:18, Mark 9:25, and Luke 9:42.) We used creative license to illustrate how the disciples did not display faith in God as they reacted to the chaos of the storm and their fear of drowning. At the end of “Miracles of Jesus,” we see how Miraculo was able to “levitate” using a hidden wire, and we know that many magicians use smoke and mirrors to make objects like park benches “disappear.” But how did Miraculo get Chris’s cell phone to “fly” out of his pocket? Street magicians often use accomplices to secretly rig unsuspecting bystanders to accomplish an illusion like this. Who were the evil-looking soldiers with swords? They were fallen angels, otherwise known as demons or evil spirits. We made them darker in appearance than the heavenly angels so it would be easier for children to see the difference. Why did you make Satan so scary with a red face, horns, fiery head, and wings? We did not want Satan to appear as a cool villain, but to be clearly evil. His expressions show his anger against God and His people. Please keep in mind that the general target age for Superbook episodes is 7 to 12 years old. However, because children differ in their spiritual development, sensitivity to dramatic depictions, and the type of programming they are accustomed to viewing, we suggest that parents consider which episodes are appropriate for each of their children. For some episodes, we advise parents to preview the episode before showing it to their children. What was the dry and barren place where Chris went? It was a desolate area where Superbook brought Chris to be tested. Why did Satan look like an angel? Satan can disguise himself to look like a heavenly angel. The Bible tells us, Even Satan disguises himself as an angel of light (2 Corinthians 11:14 NLT). Christians need to discern whether supernatural things are truly of God. What is the bad thing that Satan did? He rebelled against God. Satan desired to lift up a throne for himself and be like God. The Bible tells us about Satan’s evil plans: For you said to yourself, “I will ascend to heaven and set my throne above God’s stars. I will preside on the mountain of the gods far away in the north. I will climb to the highest heavens and be like the Most High” (Isaiah 14:13-14 NLT). What were the scrolls that John was holding when he spoke with Joy and Gizmo outside the throne room of heaven? They were the scrolls on which John recorded the visions God showed him in heaven. He wrote them down so all mankind could benefit from them. At the beginning of John’s visions in heaven, he was instructed, Write in a book everything you see, and send it to the seven churches in the cities of Ephesus, Smyrna, Pergamum, Thyatira, Sardis, Philadelphia, and Laodicea (Revelation 1:11 NLT). The book of Revelation also records, And the one sitting on the throne said, “Look, I am making everything new!” And then he said to me, “Write this down, for what I tell you is trustworthy and true” (Revelation 21:5 NLT). What is the purple-violet cloud of light that emanates from Satan’s wings and blows against Chris before Satan shows Chris a vision? It is a transitional visual effect to move from one time period or scene to another. Who were the people around Jesus when He ascended to heaven? They were the eleven remaining disciples of Jesus (Acts 1:6-11). How could Satan cause the tree to shoot up out of the ground? Before Satan rebelled against God, he was a high angel named Lucifer. He might have been an archangel. Although God cast Satan out of heaven, he still has supernatural power. The book of Revelation reveals that Satan and his allies will perform supernatural feats to deceive people. Revelation 16:14 tells us, These evil spirits had the power to work miracles. They went to every king on earth, to bring them together for a war against God All-Powerful. But that will be the day of God’s great victory (CEV). For more examples, you can read Revelation 13:3 and Revelation 13:13-14. What was the fruit on the tree? It was symbolic of the temptation to be like God and for Chris to be free of guilt and shame. It is not the same fruit that was in the Garden of Eden. What was the golden glow that came over Chris? It was the Holy Spirit who came to remind Chris of God’s promise to always be with him. The Holy Spirit assured Chris that he should not be afraid and that God would deliver him in times of trouble. Why did Satan turn into a snake with horns? We showed Satan transforming into the same snake that was in the episode “In the Beginning,” only now it was much larger and a much greater threat. We did not want to show Satan as he is depicted in the book of Revelation because it involves a large amount of symbolism—the meaning of which can be debated. Why is Jesus riding a white horse? The book of Revelation pictures Jesus riding on a white horse: Then I saw heaven opened, and a white horse was standing there. Its rider was named Faithful and True, for he judges fairly and wages a righteous war. His eyes were like flames of fire, and on his head were many crowns. A name was written on him that no one understood except himself. He wore a robe dipped in blood, and his title was the Word of God (Revelation 19:11-13, NLT). You can read the whole passage in Revelation 19:11-21. In the Superbook episode “Revelation: The Final Battle!” there were archangels behind Jesus who were also riding on white horses. Why did you not show all of the details of Jesus from the book of Revelation? The symbolism included in the depiction of Jesus is very detailed and graphic and may have been too intense or confusing for young children. Why did Jesus look so intense when He was riding on the white horse? His gaze was firm and focused on the enemy, Satan and his armies. What were the blue balls of light coming from the angelic army? They were added to visually depict some of the supernatural powers employed in the battle. What was the purple-violet light that Jesus threw from His hand against Satan? It was a visual representation of Jesus’ supernatural and divine power. We wanted children around the world to understand that Jesus was using heavenly power. Was Satan killed when the light Jesus threw hit him? Satan’s defeat by Jesus represents Satan being thrown into the fiery lake. The Bible says, Then the devil, who had deceived them, was thrown into the fiery lake of burning sulfur, joining the beast and the false prophet. There they will be tormented day and night forever and ever (Revelation 20:10 NLT). What was the golden building coming down from the sky? It was the city of God, the New Jerusalem. The book of Revelation says, And I saw the holy city, the new Jerusalem, coming down from God out of heaven like a bride beautifully dressed for her husband (Revelation 21:2 NLT). What was the vision that Chris saw at the end? Chris saw the vision that John was describing. The Bible tells us about the wonderful things that God will do: He will wipe every tear from their eyes, and there will be no more death or sorrow or crying or pain. All these things are gone forever. And the one sitting on the throne said, “Look, I am making everything new!” (Revelation 21:4-5 NLT). Why was the doorway to the throne room translucent? We wanted to give it a heavenly appearance like the main street that was clear as glass. The doorway is not same as the city gates which were made of pearls: The twelve gates were made of pearls—each gate from a single pearl! And the main street was pure gold, as clear as glass (Revelation 21:21 NLT). What were the smaller thrones surrounding the throne of God? They were the thrones of the twenty-four elders, as the book of Revelation says, Twenty-four thrones surrounded him, and twenty-four elders sat on them. They were all clothed in white and had gold crowns on their heads (Revelation 4:4 NLT). What was the waterfall coming down from the throne? It was the river of life flowing from the throne of God. The Apostle John wrote, Then the angel showed me a river with the water of life, clear as crystal, flowing from the throne of God and of the Lamb (Revelation 22:1 NLT). What were the winged creatures flying around the throne of God? They were the four living beings spoken of in the book of Revelation: In front of the throne was a shiny sea of glass, sparkling like crystal. In the center and around the throne were four living beings, each covered with eyes, front and back (Revelation 4:6 NLT). They were the ones singing “Holy, holy, holy…” The Bible says, Each of these living beings had six wings, and their wings were covered all over with eyes, inside and out. Day after day and night after night they keep on saying, “Holy, holy, holy is the Lord God, the Almighty—the one who always was, who is, and who is still to come” (Revelation 4:8 NLT). What was the green-colored cloud around the throne of God? The Bible tells us that there is a glow like that of an emerald around the throne: The one sitting on the throne was as brilliant as gemstones—like jasper and carnelian. And the glow of an emerald circled his throne like a rainbow (Revelation 4:3 NLT). Why was Jesus standing next to the throne of God? Jesus is the holy Son of God and is now glorified in heaven. The book of Revelation says, For the throne of God and of the Lamb will be there, and his servants will worship him (Revelation 22:3 NLT). The Bible also tells us, Then I saw a Lamb that looked as if it had been slaughtered, but it was now standing between the throne and the four living beings and among the twenty-four elders (Revelation 5:6 NLT). Satan is shown in several Superbook episodes. Why is he depicted as a flying serpent with wings and a tail? The Bible doesn't specifically describe Satan, who is also called Lucifer or the devil; so we used creative license to show what he may look like. In the episode “In the Beginning,” when Lucifer is first shown as an angel in heaven, he is depicted as a beautiful creature with long blond hair. When he rebels against God, he is transformed into an evil creature, and his flowing hair becomes horns. Also, his body becomes reptile-like in appearance, assuming the look of the serpent in the Garden of Eden. (See Genesis 3:1.) We did not want to create Satan to look like a character that could be construed as a cool villain. We want children to understand that there is a real enemy, and he is evil.